Series MFT & MFC full function HART Communicators and Combination Calibrator/HART Communicator, with features like Intrinsically Safe option, communications 15 seconds after ON, rugged construction, memory function for configuration saves and much more. To get more detailed information on the MFT combination calibrator (voltage, current, pressure and temperature) and HART Communicator click here. For FMC Series full function HART Communicator specifications click here. 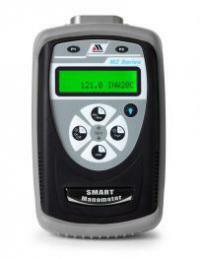 Series M200 SMART Digital Manometer family includes Portable units for differential, gauge, vacuum and absolute pressure, plus the M200-DI wet/wet DP Smart Manometer. All with high accuracy, NIST traceable calibration, temperature compensation, Intrinsically Safe option and 100+ hour life using AA batteries. Other Calibration and Measurement Products from Meriam include Handheld Digital Manometers, Rotary gas Meter testers, Differential pressure gauges and transmitters and Meriam U-Tube and Inclined Manometers. For additional information on Meriam Calibrators click here and for U-Tube and Inclined Manometers click here.